Lifestyle apps are ten a penny on the App Store these days, with many claiming they can change your life in any number of ways. The problem is, most of them reach too high and try to overcomplicate things, or baffle you with strange words and use of language. 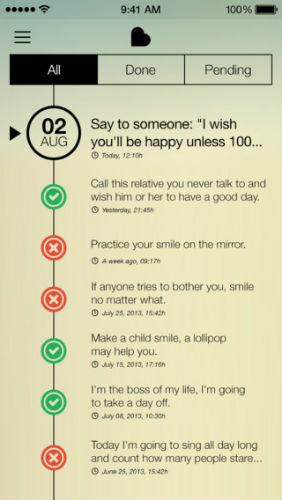 Always BHappy, available for iPhone and iPad through the Apple iTunes App Store, does things the right way. It is essentially an app aimed at cheering you up, helping you to keep a positive outlook on life and maintaining a happy lifestyle. The main way that the app does this is with daily proposals. No, not marriage proposals, but simple tasks that you can complete in the real world that, in theory, should at least make your day a little brighter, injecting some fun into your daily routine. These tasks are very clever, from calling someone you haven’t spoken to in a number of years, practising your own smile in a mirror to even taking a day off work, and each one is unique and interesting. A simple dated timeline with all your proposals, past and current. Effortlessly Monitor your account: Proposals, Happy Packs, Badges, Profile, and Preferences. 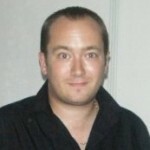 Optimization for all the latest mobile devices. Updates to ensure flawless use and new bonus features. We have infused the app with love and happiness. You can select which proposals you get from different ‘Happy Packs’, which essentially allows you to categorise the requests you get, some of which are free, and others you have to pay for. There are also rewards for completing different proposals, in the form of neat achievement style badges within the app. You can also share your achievements through Twitter, Facebook and Email, adding a nice social element into the mix that will actually help to extend the life of the app somewhat. You can sort your proposals by those you have completed, and those that you have yet to attempt. The app is well designed and attractive, with a layout that is instantly familiar and easy to use. The app is free to use, although there are extra Happy Packs to purchase it you want extra requests. 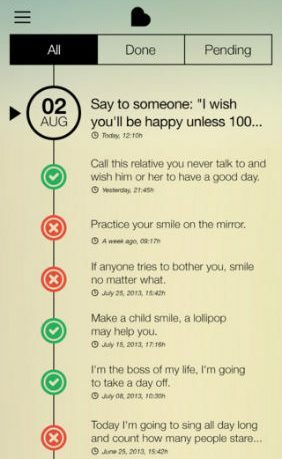 Overall, Always BHappy is a very nice app that does an excellent job of adding a sprinkling of fun and happiness to your everyday life.